Language. It allows us to communicate. To share our voice. To connect. But while language gives us a means of interacting with others, it at the same time limits our communication in at least two central ways: (1) by virtue of its particular rules and constraints (vocabulary, grammar, syntax, structure, etc. ), and (2) by enabling us to fully communicate only with those who speak that language as well. A couple of experiences that I had in December led me to reflect on the power of language, and I thought they might be worth sharing with a broader audience. Although these two anecdotes might raise more questions than answers, I’d ask you to simply consider them food for thought and invite you to chime in via the comments section below if you feel so inclined. I recently had the opportunity to tour some 13th century Mayan ruins in Tulum, Mexico. Not only did the history of this ancient city prove to be fascinating, but the location of the ruins - perched atop some craggy cliffs overlooking one of the Yucatán’s astoundingly beautiful shorelines - was nothing short of breathtaking. My tour guide was Indigenous and had grown up speaking Yucatec Maya (a Mayan language) as opposed to Spanish. He took pride in his native language - one that’s spoken by less than 800,000 people today. But he shared that many of his people have difficulty learning Spanish (the most prevalent tongue in the Yucatán and the language of its higher educations systems) because of its tenses. He went on to explain that his native language of Maya has only one tense - the present. It has no past or future tenses like English, Spanish, French, etc. For that reason, it’s often challenging for his people to approach learning other languages that possess different temporal characteristics, like tenses or chronological connectives (such as “before,” “after,” or “until” - attributes which Maya also lacks). Prior to that moment, I’d never considered that some languages might not have tenses - although I’ve since learned that numerous other examples of tenseless languages do, in fact, exist. But the idea of a language having only a present tense excited me, because it immediately made me think of Eckhart Tolle and his book, The Power of Now. More specifically, I marveled at how well a fully-present-tense language seemed to align with Tolle’s teachings on the importance of focusing one’s mind on the present moment, as opposed to ruminating on the past or fixating on the future. How would only being able to speak in the present tense influence or impact one’s life? Would it cause the speaker to focus more on the present moment? Would it make the speaker think less about the past or future - or just talk about them less? And would not thinking or talking about the past or future serve to make one happier? Along these lines, nearly a hundred years ago, linguists introduced the concept of “linguistic relativism,” which essentially proposes that the way we speak, read, and write may help determine how we see or interpret the world. 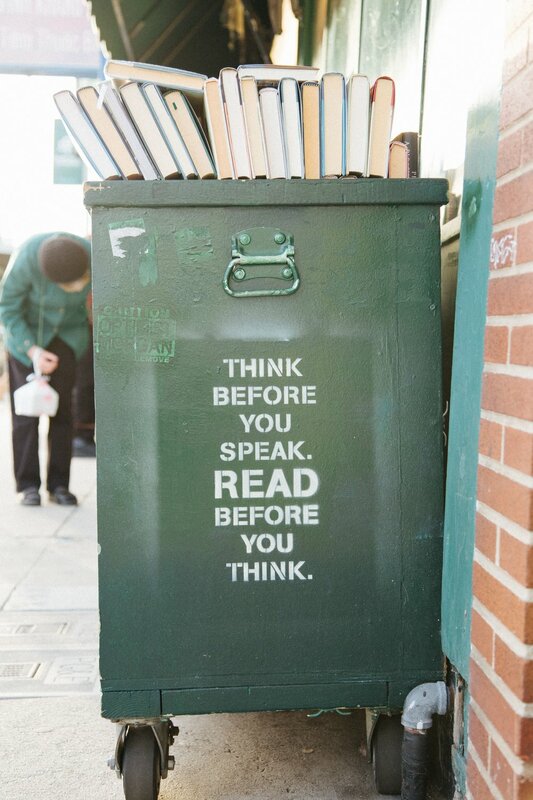 In other words, the language you speak may dictate, or at least have an influence on, how you think. The notion of linguistic relativism is controversial, but in recent years there have been studies suggesting that the idea may have merit (for instance, check out this article from The Atlantic - “Can Your Language Influence Your Spending, Eating, and Smoking Habits?”). Which naturally leads one to ask, how does our language play a role in shaping our identity? -our way of thinking? -our way of feeling? How does it impact our particular thoughts or focus in any given moment? How much does the language we speak affect who we are, how we think, or who we become? I would love to hear your own thoughts on the power that language may hold over the minds of its speakers, if any - particularly if you’re multilingual. Please share your perspective in the comments to this post. The second story that I’d like to share about the power of language has to do with its capacity for division, but also unification. And it begins with the following inquiry: Have you ever heard of “Esperanto”? My roommate posed this question to me last month upon returning from having spent a couple of months in Eastern Europe where, at one point, she had toured a museum dedicated to the subject. Esperanto is a language that was created in 1887. It was purposely constructed to serve as an international language that, as one’s second tongue, would allow people from various places and backgrounds to communicate with each other (i.e., arguably what English has become today, given its status as one of the most commonly spoken international languages). The idea behind Esperanto was that it would allow people to retain and preserve their native languages and cultural identities, but still give them a means of communicating with others who didn’t speak their native tongue. Based on the romance languages, Esperanto was meant to be a politically neutral language that could serve as a common basis for communication. Today, an estimated 2 million people worldwide speak Esperanto. (Oh, and here’s a fun fact: if you so desire, you can learn Esperanto yourself via the popular language-learning app, Duolingo). Over the course of our existence, human beings’ many different languages have served to divide us - preventing us from effectively communicating with and understanding one another. But while language can set us apart, Esperanto is about coming together. And that struck me as rather beautiful. Can you think of any analogous bases for connection that exist across other areas of our lives? If so, what? I personally feel like we need more unifiers and connectors - more “Esperantos” - out there to bring us together in this crazy, fractured world of ours. How can we find new ways to harness the power of language to benefit humanity as a whole?